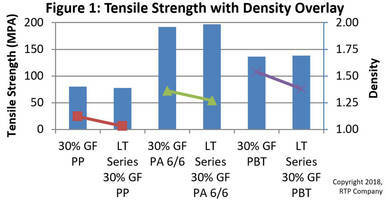 Light and Tough Compounds come with a weight of 5-10% less than typical filled compounds. The compounds are used to provide weight reductions in parts molded with glass fiber reinforcement and the density offered by the compounds is independent of wall thickness. Product is suitable for handheld, battery-operated tools, sporting goods, handheld appliances and recreational vehicle. WINONA, MN USA - (May 3, 2018) - RTP Company, a leading global compounder of custom engineered thermoplastics, is pleased to announce the development of new light and tough (LT) Compounds, a series of thermoplastic compounds that weigh 5 - 10% less than typical filled compounds, but with equivalent mechanical properties and similar shrinkage values. For specific data on LT Compounds from RTP Company, you may download product data sheets on the firm’s website. For more information on LT Compounds from RTP Company, please call (507) 454-6900, or visit www.rtpcompany.com.